Are you curious aboout the different dishes from around the world? I am. At my place of work I have colleagues from different nationalities and three of them belong to an ethnic group called Uyghur, two from Kazakhstan and one from China. Ever since I found out about their background I have been asking them about Uyghur cuisine and what kind of traditions they have. The first thing I remember saying was “wow, what are typical dishes from your region” and one day one of them handed me a cup with soup and said “Here, I brought you some soup since you are so interested in our local dishes and tell me what you think”. 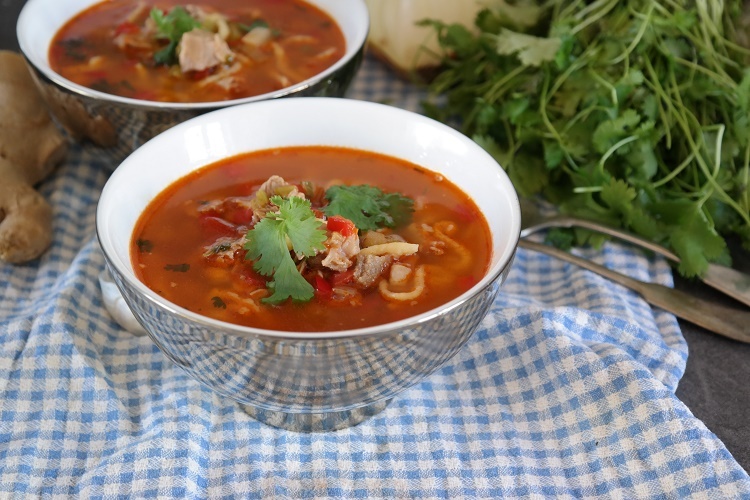 I accepted the cup and took a long whiff and it had the distinct smell of lamb and after a mouth full of this hearty soup I could taste other ingredients like paprika, garlic and coriander. I asked for the recipe, she said she did not use any but I did get instruction on how she goes about making it. Here is the result of my attempt on making this soup. 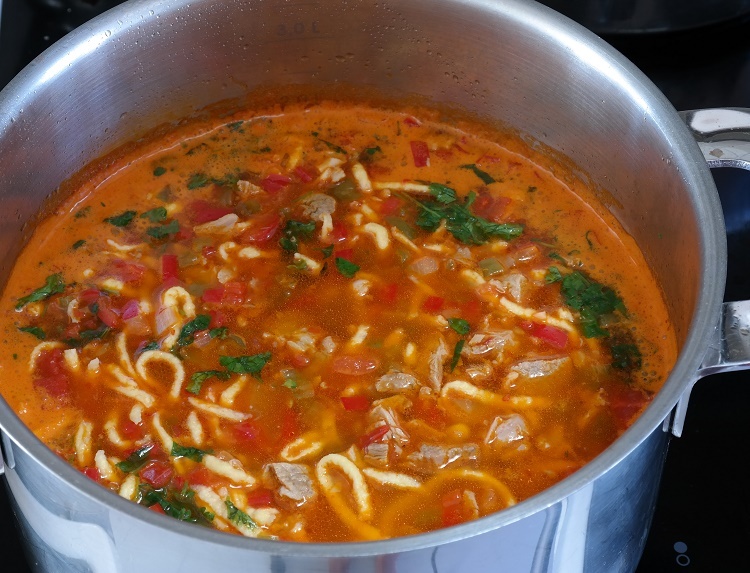 Süyuash is the general term for soup with noodles and if I understand it correctly you can use other ingredients to make a süyuash(soup) as long as it has noodles in it. 1-2 tsp salt, if you need more add this later. Coarsely chop the vegetables and put all the ingredients in a pot and bring to a boil, then turn down the heat and let it simmer for about two hours. 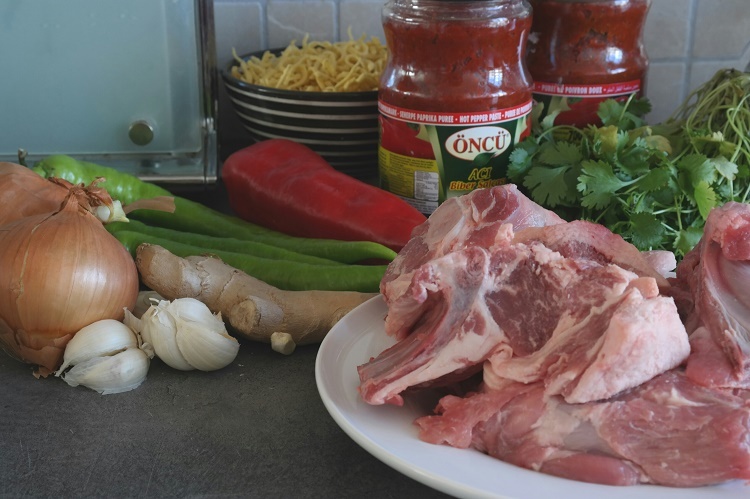 During simmering, you’ll need to remove the impurities that float to the surface. A frothy/foamy layer will form and it can be easily scooped off with a big spoon. Throw this part away. I typically check it every 20 minutes to remove this. 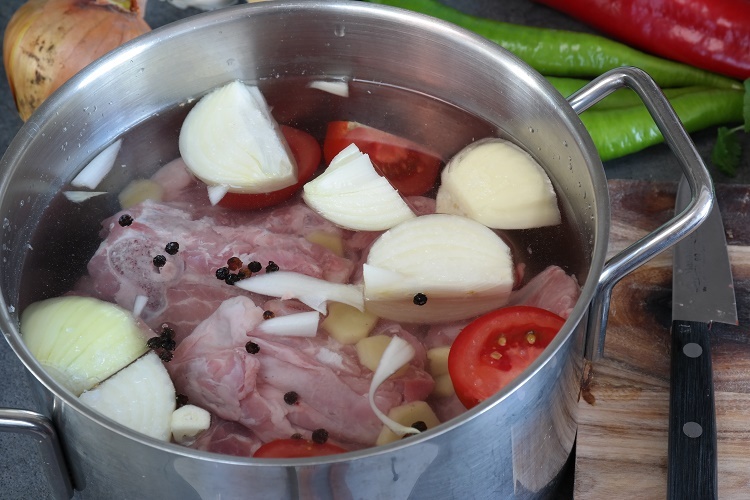 Strain the soup and dice the cooked meat and put aside. 1/2-1 cup pasta, depending on how thick you want the soup. Dice the vegetables and sautee for a few minutes in a little oil. Add the broth, meat and paprika paste, and let this simmer for a few minutes or until the veggies are soft. Then add the pasta and when this is to your liking add chopped coriander and garlic. Serve this with freshly baked bread and enjoy.